Christos Voskrese 2019 — Christos voskrese, which means Christ has Risen, is the Easter greeting in Church Slavonic which brings the response Voistinu voskrese or Indeed, He has risen. 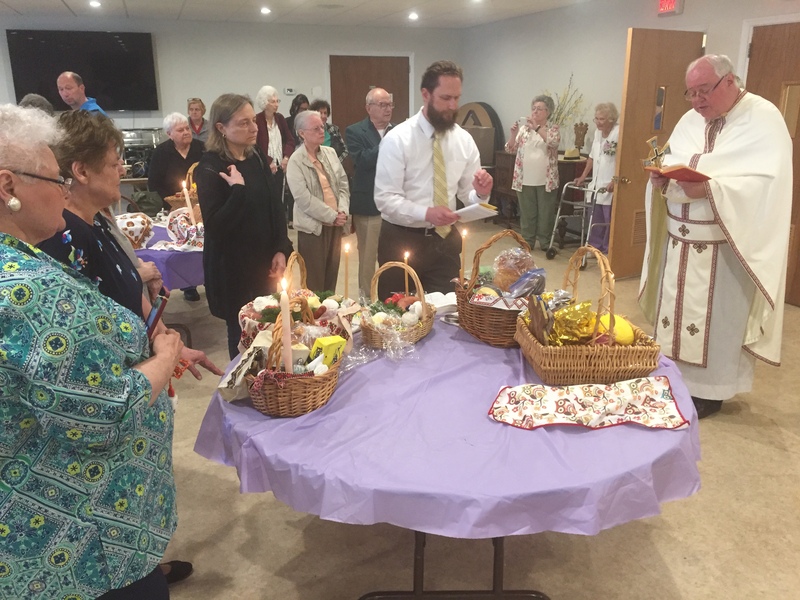 Monsignor Peter Waslo performs the traditional blessing of the baskets, Saturday, April 20 at Holy Myrrh-Bearers Ukrainian Catholic Church in Ridley, Pa.
Easter, of course, celebrates the Resurrection of the Lord Jesus and the salvation of Man. The date for Easter is the Sunday following the first full moon after the spring equinox, which is always reckoned, regardless of astronomical observations, to be March 21 as per the Western churches that use the Gregorian calendar, so Easter always falls between March 22 and April 25. The dating for Easter correlates with the means the Jews once used to set the date for Passover, which correlates with Scripture since Scripture indicates that the Crucifixion of the Lord occurred as the lambs were being slaughtered for the celebration of that holiday. In fact, in most Western languages the name for the day is a cognate of the Pesach which is the Hebrew name for Passover. In Latin it would be Pascha so Paschal lamb would be Passover lamb. In English and German, the word comes from Eostre month, which was basically April, and which the pagans who spoke Germanic languages had named for the goddess Eostre much as our own March and April are named for the Greek god and goddess Mars and Aphrodite, respectively. In Slavic, the holiday is called “Great Night” (Velikonoce in Slovak) or “Great Day” (Velikden in Ukrainian). There are some caveats regarding the date. 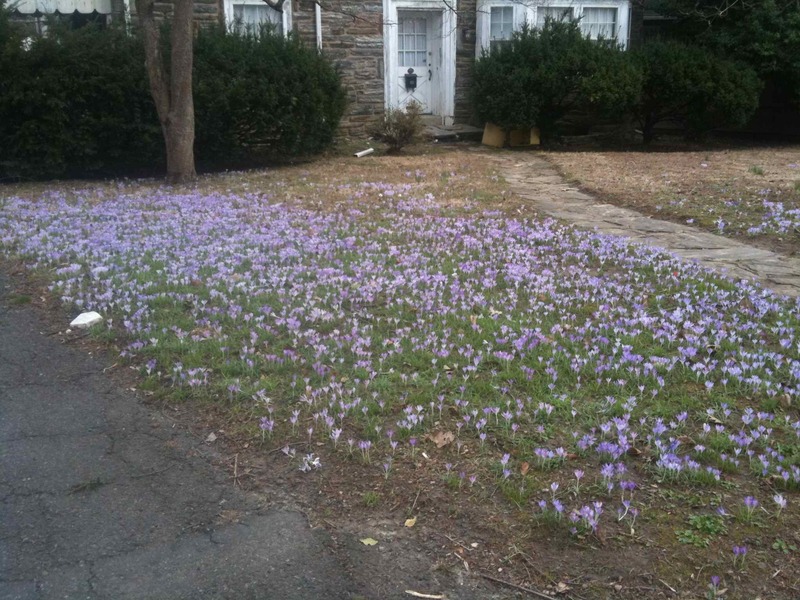 The Eastern churches that use the Julian calendar set the equinox at April 3, and, of course, the spring equinox is based on that of the Northern Hemisphere. Christmas Pagan? Nope — Conventional wisdom has become that the holiday celebrating the birth of Christ is something the early Christians co-opted from a pagan celebration of the Winter Solstice. A Muhlenberg College history professor says that is completely backwards. William J. Tighe, an associate professor at the college in Allentown, says that Christmas really was thought to be the date of the Lord Jesus’ birth. The thinking then was that great Jewish prophets died on the date of their birth or conception. The date of Jesus’ death can be calculated from Gospel accounts. The faction using the Latin calendar wound up placing the Crucifixion at March 25, according to Tighe. This was the faction that became dominant in the West. The Latin church determined that was also date that the Archangel Gabriel announced that Mary was with child. 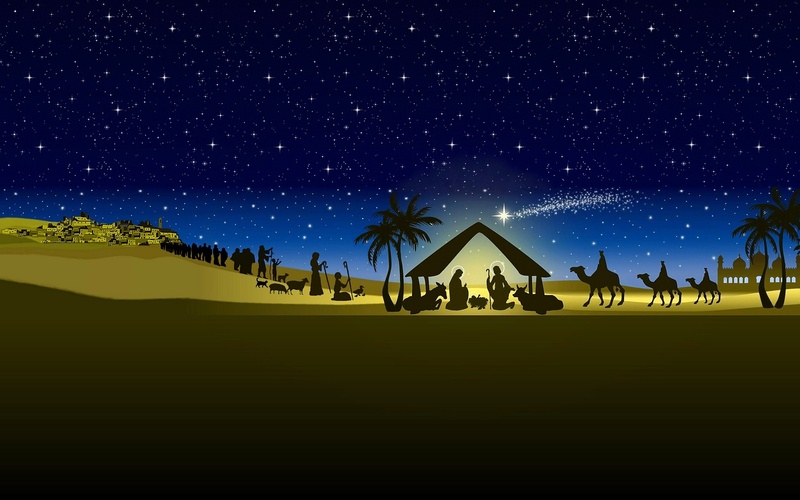 Nine months later, on Dec. 25, would be the Lord’s birth. March 25 is still celebrated as the Feast of the Annunciation. Tighe notes that Rome didn’t celebrate Dec. 25 as a pagan holiday until the anti-Christian Emperor Aurelian declared it to be the festival of the “Birth of the Unconquered Sun” in 274. By then, Christianity was already making its impact well felt on the Empire. Tighe is also a faculty advisor to the Catholic Campus Ministry and a member of St. Josaphat Ukrainian Catholic Church in Bethlehem. The English folks song Christmas is Now Drawing Near At Hand as performed by Steve Winwood. Winter 2018 Starts Now — Today, Dec. 21, is 2018’s winter solstice which is the day with the fewest hours of sunlight during the whole year. If this website’s clock is properly synched it is 5:23 pm EST. and that means winter has started. The word solstice comes from the Latin words for “sun” and “to stand still.” As per the Old Farmer’s Almanac: In the Northern Hemisphere, as summer advances to winter, the points on the horizon where the Sun rises and sets advance southward each day; the high point in the Sun’s daily path across the sky, which occurs at local noon, also moves southward each day. Here Julie Andrews sings In The Bleak Midwinter. It’s from her Christmas television special which aired Dec. 14, 1973.